Thinning is a beneficial practice whether we’re talking about lettuce starts or tree fruits. Thinning pears helps increase fruit size and health, prevents branch damage from overloading and stimulates the next year’s crop by allowing it to form fruit buds. Timing and the number of fruits to cull are important aspects to successfully knowing how to thin pear fruit. Thinning out pears will ensure big, juicy fruit and tree vigor. 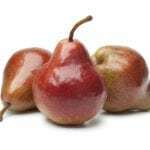 The question of when to thin pears is an important one to answer for optimum fruit production. Not all fruits need to be thinned and in fact, some will naturally thin themselves. The stone fruits, with the exception of many cherries, will develop better if some form of culling is applied. This is especially true if proper pruning wasn’t done the season prior. Reducing the fruit load on the terminal branches helps prevent overloading and damage to the limbs. 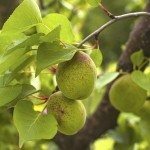 Most pear trees, whether they are a European or Asian variety, don’t need thinning. However, if your old pear tends to drop fruit early or fruits biennially, the practice may remedy these issues. There are some chemicals used in commercial production to cause selective abortion of fruit but nothing is listed for use on pear trees. Bartlett pears tend to naturally thin but harvesting young fruit early will still promote bigger, more beautiful fruit late in the season. 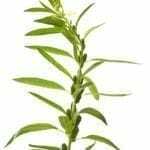 Excessive fruits compete with each other for sunlight, moisture and nutrients, leaving the entire crop with a dearth of resources. 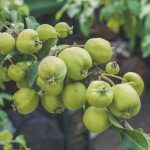 Thinning will allow the healthiest fruits to develop with a rich store of resources, resulting in more attractive and larger yields. 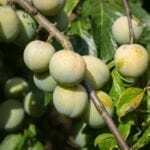 The best time to start thinning fruit is when it is small. Thinning out pears when they are about ½ to 1 inch long will allow the remaining young pears to get more sunlight and the branches to get more air. This encourages larger fruit and reduces the chances of pest problems and fungal disease. Pear fruit tree thinning later will remove many of the best fruits and not allow for enough time for the practice to be its most beneficial. As a rule, April to mid-May is the perfect time to start the process. Earlier thinning is required in long season areas such as California. If you are in doubt, check fruit about 30 to 45 days after bloom. Use clean pruning implements to prevent transmission of any diseases. Start at the ends of branches and work inward. Remove fruit with decisive cuts rather than yanking them off the petioles. This prevents damage to the bark and wood of the tree. 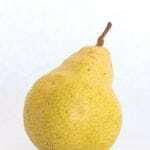 Remove small or stunted fruit as you see it and cull young pears that are misshapen. Where fruit is clustered, remove enough young fruits to leave only one or two fruits per cluster. The optimum distance between developing fruit is 6 to 8 inches. Leave the largest fruit in the cluster where possible. Consider the load on individual branches as you work. Those that bloomed excessively and set fruit should be thinned to just one pear per cluster to reduce the load on the limbs.